Demolition of the former SEU campus building at 6th and I streets is complete. All that is left of the building is a pile of rubble, which continues to be cleared away from the site. Eventually, the site will be developed as The Bard (pending PUD approval), a mixed use project with back of house operations for The Shakespeare Theatre (STC), 34 artists housing units, and 143 apartments (a portion will be set aside as affordable housing under Inclusionary Zoning) to be built by Erkiletian. The development team for the project is stepping up their PR efforts with social media, direct mailings, and a petition to city officials. Two tower cranes have arrived at Forest City’s 1001 4th Street construction site at Waterfront Station, a little more than six months after the groundbreaking. 1001 4th Street is designed by Perkins Eastman and is planned as an 11-story, 365-unit rental apartment building with 5,000 square feet of ground floor retail along with multi-story residential units facing the private drive at the north end of the site and Makemie Place. Substantial completion is scheduled for November 2016. According to the RFP, the site uses should include mixed-income housing and ground floor community-serving retail or municipal services. A municipal use that won’t be included is a new Southwest Branch library, which will remain at its current location on Wesley Place. A developer will be selected later this year after the ANC and the community has a chance to see the proposals. Sky House East was sold to Bernstein Management for $91 million according to the Washington Business Journal and has changed names to Leo at Waterfront Station. Its sister building was sold several months ago to the same owner and was renamed Lex at Waterfront Station. 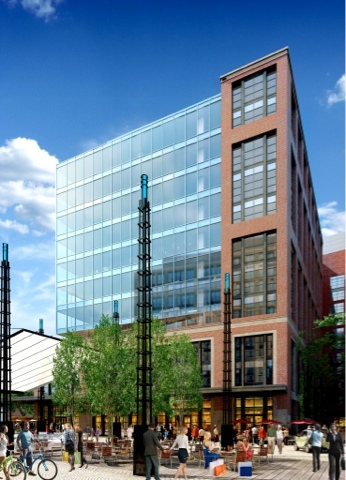 More than half of the units at Lex have been leased since marketing began in December. 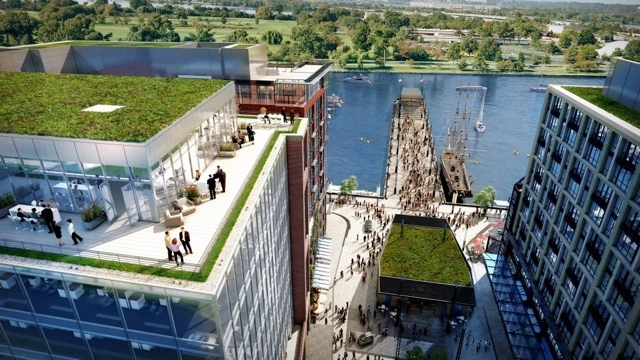 Last month, the Hoffman-Madison Waterfront team presented plans for Phase 1B of The Wharf, which includes Parcel 1 and the Municipal Fish Market to the U.S. Commission of Fine Arts. Parcel 1 is planned as a 10-story office building with about 234,000 SF of space and an additional 14,000 SF of ground floor retail. It will be located to the west of Parcel 2, which will contain Wharf Hall with apartments above. 1000 Maine Avenue, designed by Kohn Pedersen Fox Architects will include a three-level atrium and a rooftop terrace. "The Commission members commended the project team for the sophisticated concept design, noting particularly the elegance of the proposed curtainwall system with terra-cotta components. For the development of the design, they suggested further study of the proportions of the multi-story curtainwall frame on the north elevation, specifically at the recess above the retail floors, and they agreed that the primary Maine Avenue entrance to the office building would benefit from further development." The main elements of the plan for the Municipal Fish Market include Market Plaza, an area with temporary retail space and will incorporate historic buildings along with new construction; Market Square, where a market shed is planned; and the Fish Market Promenade, which will connect to the existing fish market with piers and outdoor seating. McGraw Bagnoli Architects designed the buildings and Landscape Architecture Bureau designed the public spaces. A total of six buildings are planned: Building A is the historic lunch room and oyster shed, which will contain 1,300 SF of retail space on a single floor with an oyster bar and 700 SF of outdoor patio space. The building fronts the Market Plaza and Fish Market Promenade. Building B is a rum distillery – a 5,550 SF, four-story building with a tasting room and retail store, as well as 1,500 SF of outdoor space, including a roof deck. It will be located to the east of Building A along the promenade. Building C will be a market shed, a single story building with 1,350 SF of space for a café, flower stand and temporary retail such as a farmers market and craft market, as well as an additional 1,300 SF of outdoor space. It will be located adjacent to Parcel 1 on the east side of the market. Building D is the market hall, a three-story building with 11,850 SF of space, as well as 5,650 SF of outdoor space, including a roof deck. An Italian butcher/deli and large market hall/restaurant will be located here. It will be located on the northeast corner of the market along Maine Avenue. Building C is at left; Building D is to the right. Building E will contain market pavilions along Maine Avenue. The pavilions will contain 1,000 SF of space in one-story buildings with 600 SF of outdoor space with a coffee and sandwich shop. Building F is the operations building, which will contain 1,100 SF of retail, 2,650 SF of operations space (including a fish cleaning room, dumpster, and maintenance facility) and 1,400 SF of outdoor space. "They cautioned against trying to recreate this random, energetic character in the architecture of the new buildings, which will inevitably result in a falseness made obvious by the authenticity of the existing context. In particular, they raised concerns about the diminutive scale and multiple elements of the two proposed buildings, recommending instead that these be developed with a more neutral expression as a background or frame for the historic pavilions and the existing fish vendor barges; the retail tenants themselves may provide the lively character of the marketplace." Update: Fish market tenants filing suit against Hoffman-Madison Waterfront and DC per City Paper. A building permit was approved for the 3.5-acre Waterfront Park at The Wharf according to the Washington Business Journal. The park will be located to the south of the condo/church buildings under construction in the southeastern portion of The Wharf and was designed through a community charrette process. Even before official construction begins at the park, a copper beech tree has already been planted in the future park. The tree was moved there last October from the grounds of St. Augustine's Church to make way for demolition. Other park elements include plantings, pergolas, a water feature, play mounds, pathways, seating areas, an access road for the Harbor Patrol, and a plaza. The plaza will be named after DC Delegate Eleanor Holmes Norton - the section of the park between the access road and the Wharf promenade. Construction on Waterfront Park should begin later this year and should last about 11 months, with delivery scheduled sometime in 2016 after the new church/condo buildings are complete. Yesterday was the "bottoming out" ceremony for the first phase of The Wharf, which means excavation at the massive site has been completed. The project began construction back in March of 2014 and the first phase is scheduled to deliver in the fall of 2017. On the same day as the ceremony, it was announced that the first office tenant for 800 Maine Avenue has been secured. According to a press release, the tenant will be the American Psychiatric Association (APA) which is moving back to DC from Rosslyn with more than 200 employees. The APA will occupy 63,000 SF of space, or three floors of the planned 11-story, 220,000 SF building. 800 Maine Avenue (formally known as Parcel 3A) will be located adjacent to District Pier at the gateway to The Wharf and will have private rooftop terraces. It's also next to the planned Intercontinental Hotel. Throughout the day, join us for “Talent Search,” where residents can go onstage in DPR’s Show Mobile and sing, dance, or perform whatever talent they have for fun and DPR prizes. Later in the evening, DPR will be hosting a second event, “A Splish Splash Summer” Late Night Pool Party Series at Randall Pool from 8:30pm to 11:30pm. Randall is one of the three public pools that will host the event this summer. The event series is open to all ages and is free (for both District and non-District residents) although photo ID is required for adults to enter. A DJ and music will be provided, but no outside food or drink is allowed. Representatives from Shakespeare Theater Company (STC) and their developer partner Erkiletian held a community meeting on Tuesday evening to continue a “dialogue” about their plans for The Bard, a mixed use development at the former Southeastern University building, located at 501 I Street. STC purchased 501 I Street from the GS Graduate School USA and plans to consolidate their back of house operations to the site from leased space scattered across the city, including administrative offices, studios, costume shop, classrooms, rehearsal space, as well as artist housing. Approximately 75 employees will relocate to The Bard. In order to make the project financially feasible, STC has partnered with Erkiletian, who will develop a 173-unit residential building that varies in height between three and nine stories, which is designed by Shalom Baranes Associates, the same architect as the office buildings at Waterfront Station. Some changes were made to the development since the duo met with the community several months ago. The main change was moving Shakespeare’s rehearsal space at the corner of 6th and I streets 14 feet below grade. Below the rehearsal space will be a level of parking accommodating 69 vehicles. This change allowed a portion of the residential building that is set back from I Street to rise to eight stories instead of nine. There is a three-story section along I Street that wraps around the alley from which the eight-story section of the building is set back that will include 30 artist housing units. In addition, five two-story townhouses off of the alley on the northeast corner of the site will contain an additional eight parking spaces. However, the section of the building that is at the corner of 6th and I streets remains at nine stories, plus a penthouse. The unit mix is comprised of 25% studios, 40% 1BR and 1BR/Dens and 35% 2BR units. Access to the project will be via 6th Street and not I Street due to DDOT’s concerns about safety since Amidon-Bowen is located next door along I Street. The meeting was contentious at times. Concerns about the building’s height and limited parking were echoed by many in the audience. Although the taller section of the building along I Street was set back from the street frontage with a three-story section and one story was removed from the taller section, the nine-story plus penthouse section at the corner of 6th and I remained a major problem for residents, some of whom have homes that will directly face the building and feel that the proposed building is out of place in their neighborhood. It was also brought up that the building will tower over neighboring Amidon-Bowen Elementary, casting shadows on the school. To help alleviate concerns about the limited parking and the potential for tenants of the new building to use street parking, residents of the rental building will not be eligible for Residential Permit Parking (RPP) and the property manager will be doing a periodic audit of the DMV to make sure residents don’t try to game the system. Parking will not be provided to STC’s employees. STC and Erkiletian have brought in Bo Shuff to deal with community outreach for The Bard. A phone town hall was held Wednesday evening and other outreach efforts will be implemented over the summer to keep residents informed about the project. A project website will soon go live and a Facebook page has been set up so the project’s process can be followed via social media. Bo can be reached at outreach@thebard501.com or by phone: 571-336-6343. Currently, zoning at the site does not allow what the development team has proposed, but they intend on going through the Planned Unit Development process unless their lobbying efforts are successful at the DC Council to make changes to the Southwest Neighborhood Plan. Demolition began last week at the site, which should last another three to four weeks.